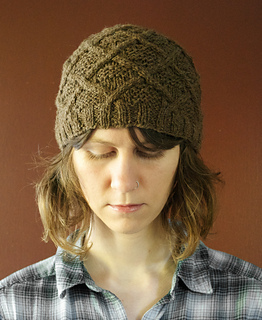 Criss-crossing cables are interspersed with patches of garter stitch to create a unisex hat that’s visually rich and fun to knit. 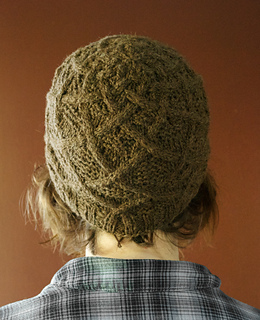 The cable pattern swirls intricately at the crown. 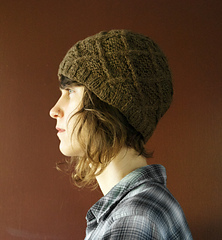 This cozy cap is named for the springy, spongy un-dyed Manx Loughan yarn, which knits into a light, warm accessory with a wonderfully rustic texture. Cable pattern is given in written and charted instructions. Needle C: US #7/4.5 mm needle; Use preferred small-circumference circular knitting method such as double pointed needles, magic loop, or two circulars.